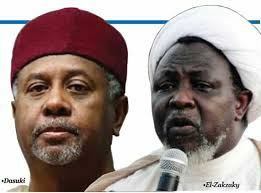 By Sadiq Umar – The Christian Association of Nigeria (CAN) has urged President Muhammadu Buhari, to release from illegal detention former National Security Adviser (NSA), Sambo Dasuki (rtd) and the leader of the Islamic Movement of Nigeria (IMN), Ibrahim El-Zakzaky who are still being held against court orders. The umbrella Christian body explained that the release of both men would ease tension in the land and give credit to the administration internationally. CAN President, Samson Ayokunle who spoke on behalf of other Christian leaders during a visit to the State House, Abuja, weekend reminded Mr. Buhari that Mr. Dasuki and Mr. El-Zakzaky are still being held by the authorities despite several court orders for their release. CAN, while also demanding a total overhaul of the nation’s security architecture and the removal of service chiefs who, they argued, have overstayed their usefulness, spoke against the use of live bullets by the military in quelling civil unrest. The CAN president said as the nation approaches another election year, there is the need for a presidential order to the police and other security agencies to be non-partisan, neutral and apolitical with a view to securing international respect and honour for the country in the comity of nations. “The degree of desperation we saw in the politicians during the intra-party elections that took place recently do not give many people hope concerning 2019 unless serious steps are taken to let decency prevail,” Mr. Ayokunle noted. “We appeal to you to make sure that the law enforcement agents and the election umpire do their work professionally without the intimidation of voters, manipulation and any trace of violence throughout the period of elections,” he added. According to CAN, the survival and peace of Nigeria are greater than the ambition of any politician. The Christian leaders urged the restoration of peace and sanity in troubled spots in the country, especially in the states of Adamawa, Benue, Plateau, Taraba, Kaduna and Zamfara. The Christian body also called for an enhanced security and flushing out of attackers in affected towns like Gashish District on the Plateau, in order to allow sacked communities in the various IDP camps return to their towns and villages.